HomeNews in PerspectiveIs finance minister Marrah in contempt of parliament? November 27, 2013 Abdul Rashid Thomas News in Perspective Comments Off on Is finance minister Marrah in contempt of parliament? It is the constitutional duty of every democratically elected government to ensure that their plans and performance are first reported to parliament, especially the government’s economic performance and budgetary plans for the ensuing year, prior to publication. (Photo: minister Marrah). 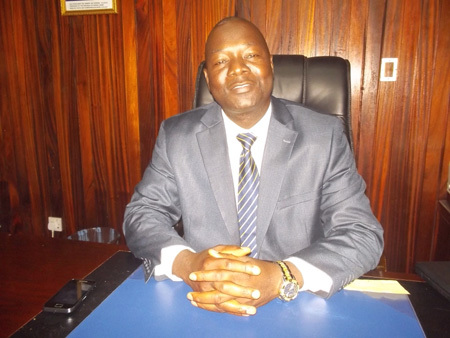 And it is the tradition that the finance minister of Sierra Leone will always go to parliament once in every year to read out his Annual Budget Statement, detailing the government’s revenue and expenditure statement for the approval of the elected House. To do otherwise is nothing other than contempt of parliament and a clear breach of that constitutional responsibility. So, is finance minister Marah in contempt of parliament when he ‘leaked’ his financial statement to the Press Attaché at the Sierra Leone’s Embassy in Saudi Arabia, before delivering the statement to parliament this coming Friday, 29th November 2013? “During the recent visit of the current Minister of Finance and Economic Development, Dr. Kaifala Marrah to Saudi Arabia to engage the Islamic Development Bank (IDB) and the Saudi Fund for Development – two international financial institutions supporting Sierra Leone with community development projects such as education, infrastructure and health – he disclosed in a brief interview that inflation has fallen to 9.5 percent for this year. Some of the reasons for this, he said, are: “Stability in the exchange rate, increased availability of locally produced food items; and Government policy to keep unchanged domestic pump prices of petroleum products”. The Finance Minister also disclosed that trade deficit narrowed to US$352 million during the course of 2012 compared to US$556 million in 2011. And some of the reasons for the narrowing of trade deficit are that: “More than proportionate increase in exports compared to imports; the significant boost in exports in 2012 was largely due to the commencement of iron ore mining; and the improved market conditions for rutile”. He also said that in recent years, domestic revenue collection improved considerably, increasing from 13.3 percent of GDP in 2010 to 21.3 percent in 2012 representing more than three times the average for sub-Sahara Africa. Reasons for the real GPD growth, according to the Minister are: “Significant expansion in mining sector activities and other increased activities in agriculture, construction, manufacturing and the services sector”. On real GDP and inflation, the erudite doctor added, the later fell to 11.3 percent in October 2012 from 16.7 percent in 2011. Also, according to a document prepared by a team of experts from the Ministry of Finance and Economic Development and the Non-State Actors, ‘2013 Citizen’s Budget,’ this improvement in the economy culminated in increasing the country’s gross international reserves to US$414.7 million at the end of December 2012 from US$379.8 million at the end of December 2011. The citizen’s budget is a non-technical presentation of the government budget which is intended to enable the public including those persons not familiar with government fiscal operations, understand government plans and programs. The objective of the document is for citizens to know the estimate of revenues received by the government of Sierra Leone, as well as the expenditure estimate that are authorized to Ministries, Department and Agencies (MDA’s) including local councils. In effect, the Government achieved tremendously in its macro-economic performance in 2012 and it also made tremendous achievements in its budgetary performance for the Fiscal Year 2012. According to the Citizen’s Budget 2013, “total revenue and grants reached Le 1.9 trillion by the end of 2012, exceeding the original target by Le 0.3 trillion (Le 300 billion); estimated income tax revenues collected at end of 2012 exceeds its targets by Le 329.3 billion; and estimated collection from Goods and Services Tax (GST) and Customs and Excise duties stood at Le 434.1 billion and Le 337.3 billion, respectively at end 2012”. On expenditures, “total expenditure and net landing reached Le 2.7 billion as at end 2012 falling short of the target by Le 0.1 trillion (Le 100 billion); and, recurrent expenditures that comprise of wages and salaries, goods and services and interest payments estimated at Le 1.9 trillion as at end December 2012 exceeded its target Le 0.1 trillion (Le 100 billion). In transition from Agenda for Change to the Agenda for Prosperity, the ‘Citizen’s Budget 2013’ states that the Government will continue to allocate a huge part of the 2013 budget to finance infrastructure projects including: construction of highways and streets in bigger towns, installation of thermal plants and transmission and distribution lines, construction and rehabilitation of water supply systems construction/rehabilitation of schools and hospitals; providing additional support to the Free Healthcare Programme; and improving agricultural productivity. According to the document, Government aims to achieve in the medium term by preserving gains made in stabilizing the economy; ensuring rapid and sustained green economic growth by using the country’s natural resources in a sustainable manner; creating fiscal space for high-priority public investments to spur long term growth and development; and ensuring sustainable debt level. The Government wants to achieve these objectives through raising mining revenues, strengthening revenue administration and prudent expenditure management. The Financial Year 2013 Budget marked the start of the implementation of the Government’s “Agenda for Prosperity” that comprised eight (8) pillars – Economic Diversification, Managing Natural Resources, Human Development International Competitiveness, employment and Labour, Social Protection, Governance, and Gender Equality and Women’s Empowerment. The Government raises funds to meet the needs of the country through taxes, custom duties, mining royalties, road user charges and other fees and licenses etc. The document states that: “Total domestic revenue and grants for 2013 is estimated Le 2.7 trillion. Of this, the National Revenue Authority (NRA) will collect an estimated sum Le 2.1 trillion whilst the remaining Le 0.6 (Le 600 billion), which represents 22.2 percent of the total revenue will come from foreign sources (grants)”. Priority sector-specific spending for 2013, according to the ‘Citizen’s Budget 2013’, includes the following sectors: Roads (25.8%), Energy (7.3%), Agriculture 91.0%), Education (10.1%) and Health (10.5%) while other sectors include; transport, water supply, youth and sports, social protection for vulnerable groups, etc. 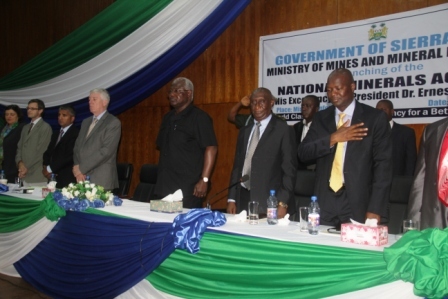 In spite of the challenges, the Government has progressed in public financial management and accountability from the time it produced the first Citizen’s Budgets for 2012 in line with President Dr. Ernest Bai Koroma’s “declaration of the 50th Independence Anniversary address that every citizen is a Public Monitor’’. The main concern of public financial management is how to efficiently and effectively utilize public resources to meet the needs of the country in an equitable manner. The budgetary process is an important part of it. The Government in its budgetary process considers key issues such as the degree of discipline, efficiency in revenue mobilization and extent of transparency, accountability and control in the tax system. Such issues are considered for quality budgetary processes which are quite visible in the Citizens Budgets for the 2012 and 2013 Financial Years. While ministers may know and understand their subject matter – in this case public finance management, it is imperative that they also understand and respect ‘due processes’ and their constitutional responsibilities as public servants. Minister Marrah’s first duty, before publishing his financial statement ought to have been his duty to the elected members in the Houses of Parliament, whose responsibility it is to approve the minister’s financial plans for 2013. And now that those plans have been leaked to the media, one has to call into question president Koroma’s lambasting of the population for their lawlessness. If ministers cannot be bothered to abide by the Laws of the land, why should the citizens?